Welcome To Gustan Cho Associates Mortgage Group. We are going to show our viewers some tricks of the trade to boost credit scores to qualify for mortgage loans on this page. One of the main reasons why consumer credit scores are low is due to not having any revolving credit tradelines. Borrowers with under 600 credit scores can easily boost their scores by adding positive credit. However, by paying down the card balance to lower than 10% or $100, scores will increase substantially. The credit card that we are highly recommending is an unsecured card that almost all applicants, whether you have poor credit or low scores will get approved and is a powerful tool to boost your FICO in 30 days of less. 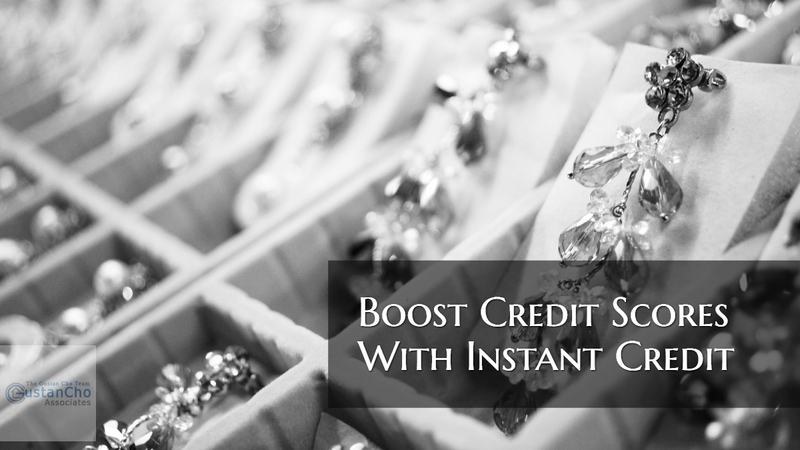 Borrowers can boost credit score with instant credit by visiting https://www.myjewelersclub.com . How Does This Card Work? This unsecured card was developed and launched by mortgage professionals to help borrowers who needs to boost their scores as soon as possible in order to qualify for a mortgage. Most lenders will have a minimum amount of 3 credit tradelines that has been seasoned for at least 12 months. There is a hard pull from Transunion only, unless there is not enough information available, and then another credit report will be pulled from one other bureau. *Active Bankruptcy. Applicants can only get approved after a Chapter 7 Bankruptcy discharged date or one year into a Chapter 13 Bankruptcy repayment plan with a timely payment history. *Child Support/Alimony: Applicants who are delinquent on your child support payments and/or alimony payments, they will not get approved for the https://www.myjewelersclub.com $5,000 unsecured card. You can reach out to us at gcho@loancabin.com or call or text us at 262-716-8151. Looking forward to working with you. ​No one’s perfect and mistakes happen, recently I met with my mortgage lender to discuss financing options because I wanted a bigger house that suits me and my family and discovered errors on my credit report, such as late payments, and my score was around 618 after it dropped from 677. I told myself that whatever the case may be, I’d take the steps to heal my credit. I was researching that night when i found the contact of a top credit hacker/specialist on multiple blogs and on Google too. I took the leap of faith and contacted him that same night. After I made the deposit I was told to check my credit report in 3 working days. I took the risk and that’s the best decision of my life when i saw that my score was in 802 and my report was clean and free off inquiries and other negatives. Cash is king but credit is POWER. I promised to make him known to the world because i know many US families are faced with similar or even worst credit problems. Mike Gracz, Alex Carlucci, Massimo Ressa, Maria Windham, Dale Elenteny, Dora Ali, Joe Garza, Raul Enriquez, Ricky Chaparro, John Strange, Bianca Piverger, and Gustan Cho are the best mortgage professionals who helped me close on my home loan. Piotr Bieda helped with quarterbacking the whole process. Gustan Cho Associates at Loan Cabin Inc. is the best national mortgage banking company in this planet. Thank you Gustan Cho Associates and the Team at Gustan Cho Associates.